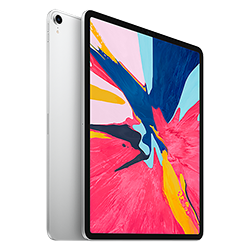 The 12.9-inch iPad Pro is immensely powerful, portable, and capable, while the A12X Bionic chip delivers more power than most PC laptops. The redesigned Retina display is more responsive and immersive with smoother scrolling and swiping. Combined with Apple Pencil, the Smart Keyboard, a 12MP camera, 7MP FaceTime HD camera, up to 10 hours of battery life, Wi-Fi, 4 Touch ID, Apple Pay, and iOS® the most advanced mobile operating system®, iPad Pro is designed for the world we live in today. With AppleCare+, get expert telephone technical support and up to two years of additional hardware coverage from your iPad original purchase date for just $99, including up to two incidents of accidental damage, each subject to a $49 service fee plus applicable taxes. AppleCare+ benefits are separate from any legal rights provided by consumer protection laws. For extended coverage, AppleCare+ must be purchased at time of iPad purchase or from Apple within 60 days of eligible iPad purchase. Electronic Waste Recycling Fee: The state of California requires a $5 recycling fee for electronic displays great than four inches and less than 15 inches. This fee is paid to the state of California and is not retained by the SDSU Bookstore. This fee will be automatically added to your hardware purchase. Please note: With the purchase of an Applecare+ Plus Connect Protection Plan, the SDSU Bookstore will enroll your product upon order fulfillment. Once completed, you will receive an email directly from Apple. No further action is required on your part. Click here to view our Refund Policy.